There are a lot of iced coffee options when you go to a coffee shop, from simple coffee over ice to complex blended coffee drinks. There aren’t as many options when it comes to tea, which is typically offered only as simple ice tea, either sweetened or not. Teas a very versatile and there is a lot more than you can do with them than just pour them over ice. This Green Tea Strawberry Ice Blended is one drink that I’ve been enjoying a lot this summer already. It’s incredibly refreshing and has just the right amount of sweetness to it. The drink starts with double strength green tea, which you can make by steeping two to four (depending on the intensity of your choice of green tea) in hot water. You can use any green tea that you like in this recipe. There are all kinds of fruit-infused green teas on the market that would all work very well. I happen to think that jasmine green teas go really well with the fresh strawberries. The berries add a lot of sweetness and a beautiful color to the blended drink, as well as giving it some extra body. 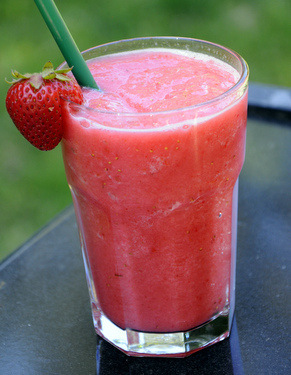 In a blender, combine green tea, fresh strawberries, sugar and ice. Blend on low speed to crush the ice, then turn the blender up to high and blend until smooth. Add more sugar to taste, if needed.